So as many of you already know I am a member of Crowdtap. Through Crowdtap I was picked to be part of the Old Navy Style Council. This has been such an amazing group to be a part of. I have had the opportunity to try and share with friends two different pairs of activewear pants, jeans and most recently T-shirts and tanks. I have always been a fan of Old Navy clothes but I was thrilled to hear they had changed the fabric for the T-shirts and tank tops. After I heard this I was not sure what to expect but when I got to the store I was pleasantly surprised. The fabric that Old Navy had changed to was so soft. I also was excited to see that the fit seemed a little bit better. In the past many of my tanks from Old Navy had a boxy shape to them and although I really liked them they were not the most flattering. The new shirts really are a better style and feel. 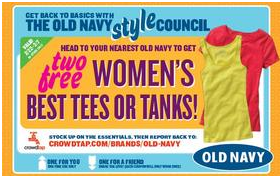 If you have not joined Crowdtap yet you really should so you can start sampling and sharing Old Navy clothes!